Food manufacturers face the daily challenge of ensuring stable and safe supplies of food products to their customers. 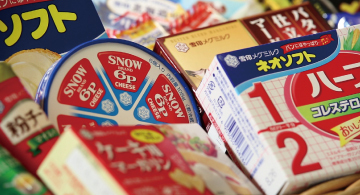 For its part, Megmilk Snow Brand Co., Ltd., decided to build a vast new plant to consolidate its existing plants scattered across Japan and to deliver more than 200 types of cheese, margarine, and other products to consumers under conditions that ensure reliability and safety. Hitachi worked in partnership with Megmilk Snow Brand starting from the planning stages of this new plant, with the objective of building new production and logistics systems that incorporate the latest information technologies. The primary goal of the food products industry is to establish stable supplies of safe and reliable food products. 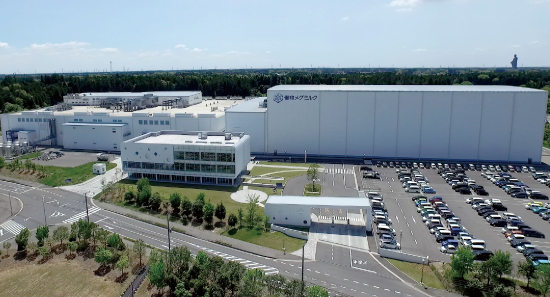 To this end, Megmilk Snow Brand Co., Ltd., decided to build a single plant to consolidate its manufacturing plants and product warehouses scattered across Japan. To do so, the company needed to create a new system that improved the efficiency of its production and logistics systems. The construction of the new plant had three goals: rebuilding Megmilk Snow Brand's overall supply chain management system, streamlining and improving the efficiency of production lines, and enhancing product traceability. To achieve these goals, Hitachi developed an integrated production management system that addresses all steps from production to logistics. This integrated production management system fulfilled Megmilk Snow Brand's initial goals of generating substantial cost benefits through the seamless integration of all processes, improving efficiency through the automation of production lines, and enhancing traceability through the integrated management of production, logistics, and quality data. The project introduced the next-generation production and logistics systems the company needed to ensure a stable supply of safe and reliable food products. The social environment of food is changing rapidly in light of globalizing food markets, labor shortages at production sites, and the increasing complexity of production and distribution chains. Beyond these factors, consumers have become increasingly concerned about food safety and dependability. In this environment, the food products industry must ensure the stable supply of reliably safe and healthy food. Taking these factors into account, Hitachi began its participation in the construction of Megmilk Snow Brand's Ami Plant in June 2011. The vision behind the construction of the new plant was to revise the production and logistics systems in a manner that would ensure the continued growth of Megmilk Snow Brand well into the future. Construction was slated to take place in the town of Ami, Ibaraki Prefecture, where the Ami Plant would consolidate into a single location three manufacturing plants (from Kansai, Yokohama, and Atsugi) and product warehouses previously split between the Kanto and Kansai areas, thus making production and logistics systems more efficient. 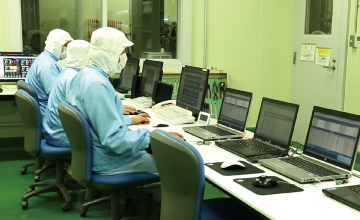 Hitachi participated from the basic planning stages of the integrated production management system, the key component to improving efficiency at the new plant. The system was designed to ensure the stable supply of safe and reliable food products by incorporating information technologies into production and logistics systems. 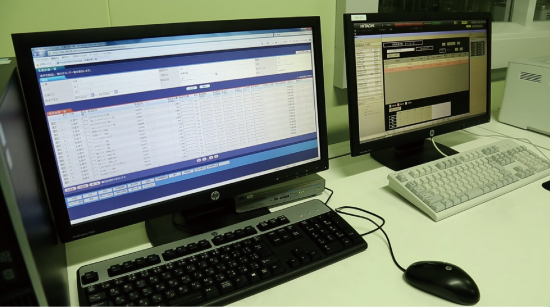 Essential to achieving these three goals was the development of an integrated production management system: that is, an IT system to support production at the plant. In addition to developing subsystems for production management, manufacturing processes, line management, and the control of various devices, the newly developed integrated production management system needed to be able to link to and coordinate with other systems, including systems for demand/supply planning, business performance management, and logistics and warehouse management. Assigned overall responsibility for the plant's IT systems, Hitachi made the adjustments needed to ensure the successful integration of individual systems. Furthermore, Hitachi coordinated the integrated production management system and the manufacturing and inspection equipment to be installed in the plant within a short timeframe and proposed total solutions for other equipment not necessarily within the scope of information (IT) or operations technology (OT), including generators, air conditioning, and freezers. In May 2015, some five years following the basic planning stage, the integrated production management system was completed, concurrently with the completion of construction on one of Japan's largest dairy-product production facilities. The Ami Plant's integrated manufacturing management system is based on Hitachi's Product NEO, a manufacturing execution system (MES) for plants that links management directly to the production worksite. The system represents a distillation of all the expertise Hitachi has accumulated to date in building production management systems for the food products industry. It deployed a value chain in which processes from the procurement of imported raw materials to domestic procurement, production, and logistics management are linked seamlessly, based on changes in the logistics network and the integration of production and logistics centers. This produced massive cost benefits. By automating the supply of raw materials from warehouses, production equipment configuration, and mixing condition management, the system realized large-scale improvements in production efficiency. In addition to matching automated controls to each of the products produced and to production volumes, the system can quickly respond to sudden production line changes and help minimize operational errors by coordinating manual operations and automated controls, even in non-automated processes. In the area of enhancements to traceability, the system has made it possible to trace products in units of individual cases. It secures the precision, detail, and breadth of tracing data through integrated management of production, logistics, and quality control data. It has also enhanced various related systems, including substantially reducing the time required to search for and find information. In these ways, Product NEO has played a major role in implementing integrated control of the plant. By fusing the domains of IT (managing production processes) and OT (production lines and equipment), it has made it possible to control, in real-time, processes ranging from order receipt to production and shipping. The successful deployment of these next-generation production and logistics systems ensures the stable supply of safe and reliable food products. When the construction plan for the Ami Plant was first considered, almost no one had heard the term “Internet of Things” (IoT). Even so, the plant's equipment incorporates countless sensors to maximize the power of IT. Future plans call for evolving the plant into a smart plant based on the analysis and use of data obtained from these sensors to increase yields for cheese and other products and improve facility maintenance. Since operations began, the Ami Plant's integrated production management system has operated smoothly and generated significant results. Many other companies are also planning to revise their manufacturing workplaces to address various issues and improve management. Amid these circumstances, Hitachi will continue to propose innovative solutions in the manufacturing field through collaborative creation with its customers as part of its mission to achieve social innovation. View a video of our co-created project with Megmilk Snow Brand to deliver safe and reliable food products to consumers.